The bonxie or great skua (Stercorarius skua) is a pirate of the seas. Mobbing gulls for their catch and chasing sheep there are no boundaries for these large birds. Their nests are made of grass in small dimples in the undulating cliff tops of Shetland. Once in decline they are now making a return. One small family was living on the cliff top near Hermaness in Shetland. Sheep were grazing around this pair, warnings being giving from time to time when the sheep came too close. Despite their harsh behaviour dive bombing and attacking anyone who comes near their nest including humans and their constant hunt for rabbits, puffins and anything else that may be vaguely edible they are good parents. 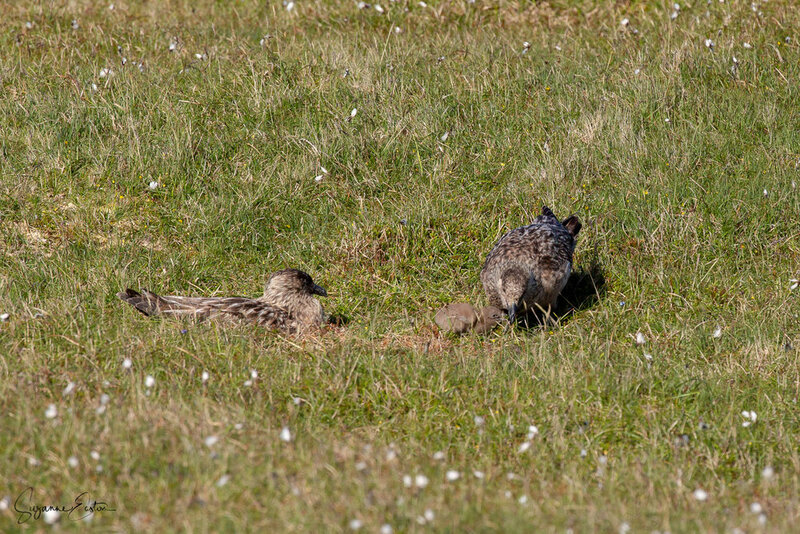 This pair had one small chick, fed regurgitated food by the adult before being delicately cared for by both parents.